Moods are Symptoms. Look Under the Surface & CONNECT With the Other Person to SOLVE or PREVENT an Outburst Problem. Moods are symptoms. Don’t just react. Look under the surface and connect with the other person to solve or even prevent an outburst, tantrum, or other negative behavior. 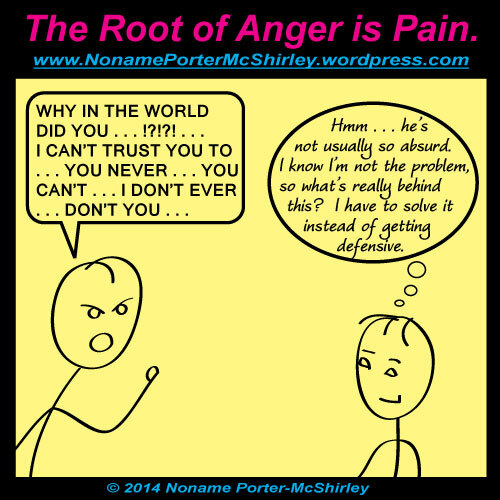 I talked about this in a previous post, “Pain Is the Root Of Anger, and Why You Should Care” but today I’d like to amplify that by sharing the following post by Rebecca Thompson, M.S., MFT. Her blog is about parenting, and this post of hers in particular reminded me of when my son was a toddler and he would routinely become annoying, fussy, and troublesome when he was tired. It was an irritating distraction for work-at-home parents. Of course the instantaneous reactionary impulse was to be short with him, tell him to stop being that way, even yell at him. But I wanted to love and help him, not hurt him. I found that all I had to do when he started acting badly, was realize that he had been awake for hours, and then pick him up and rock him on my shoulder. He felt the loving connection and quickly fell asleep. When he awoke, he was always able to behave much better. For older kids too big to hold or too old for naps, a hug can be just as refreshing–like rebooting a computer which has clogged up and can’t function right. For even older people or those you aren’t so personal with, look for a way to give a verbal hug. A kind word, compliment, or some acknowledgement that you are sympathetic. Meeting and treating on a personal root level works with a person of any age—infant, toddler, teen, adult, and elderly. It can even work with animals. Tired of Feeling Sad, Angry, Vengeful? Decide how you WANT to feel, and ACT as if it were real. Pretend that you don’t feel like smashing, hitting, yelling, crying yourself to sleep. Give a hug, a kind word, a calm response; start a good topic. Watch your mood really change, your heart soften, your self lighten, the air clear. Watch those around you melt a little too; they may even apologize. If they don’t, at least they may slowly follow your lead in peaceful positive directions. And if not even that, then you’ll feel better for not joining them in hurtful behavior. But hope for the best – act as if you expect them to join you in positivity; make space for them. Everyone feels like fighting when pushed; so back off, offer a little metaphorical milk, and most folks will put their claws away. Life will seem brighter and more lovely when you practice love. Just like anyone determined to learn a skill, you’ll make mistakes; but keep practicing acts of kindness until you become kind. For even faster and truer results, consult and seek love and guidance from the creator and source of love – God Himself. Now, what’s your next move, your next word? Make it a good one, and enjoy the results.